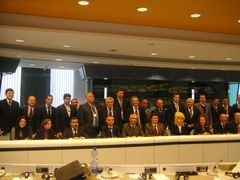 The meeting was attended by the official delegations of the member-states to the «Basic Multilateral Agreement on International Transport for Development of the Europe-the Caucasus-Asia Corridor» (MLA), the Permanent Representatives (National Secretaries) of the Permanent Secretariat (PS) IGC TRACECA, the Permanent observer of the Republic of Lithuania in the IGC TRACECA, representatives of the European Commission, Deputy Director General of the International Road Transport Union and team leaders of TRACECA projects. A report on the implementation of the Decisions of the Seventh Annual Meeting of the IGC TRACECA of the presiding Party in the IGC TRACECA of Kyrgyz Republic was submitted to the participants of the IGC meeting, followed by the handing-over procedure of the chairmanship in the IGC TRACECA to the Republic of Moldova. Mr. Adylbek Akmatov TRACECA National Secretary of Kyrgyz Republic, handing over the chairmanship to the Deputy Vice Prime-Minister and Minister of Economy of the Republic of Moldova, Mr. Octavian Calmic wished the new Chairman of the IGC TRACECA lots of success in further work. Mr. Calmic assured the participants of the meeting of the IGC TRACECA that the Republic of Moldova will continue intensive activities on the development of the international transport corridor “Europe-Caucasus-Asia”. On behalf of the European Commission, Mr. Hughes Mingarelli, Deputy Director General of the Directorate General for External Relations of European Commission has delivered a welcome speech. During the conference there were heard reports of the heads of the delegations of the IGC TRACECA member-states on decisions of the IGC on the development of the TRACECA corridor. With a view to ensure the attractiveness of the TRACECA routes the IGC approved the Concept of Development of International Road Traffic along the transport corridor Europe-the Caucasus-Asia with a view to increase the competitiveness and attractiveness of the TRACECA road routes elaborated jointly with IRU and recommended actions of the PS IGC TRACECA with a view to increase the competitiveness of the corridor. Summing up the results of the Conference, the participants of the meeting noted the significance of the outcomes of the Eighth Meeting of the IGC TRACECA. Particularly, IGC supported the initiation of the TRACECA reform, directed towards the realization of the aims and objectives intended to ensure an efficient dialogue with the European institutions, further strengthening of transport infrastructure and adopted Statute of the PS IGC TRACECA. 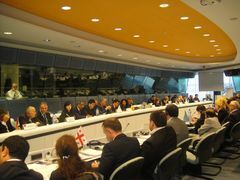 IGC highly appreciated the outcomes of the First TRACECA Investment Forum which provided for a constructive dialogue between the Governments of the Parties and the International Financial Institutions to attract the investments to implement priority infrastructure projects within the Transport Corridor Europe-Caucasus-Asia. In accordance with new regulations of the Permanent Secretariat, IGC meeting has elected Eduard Biriucov as a Secretary General of the PS IGC TRACECA for the period of presidency of the Republic of Moldova and Romania in the IGC TRACECA. 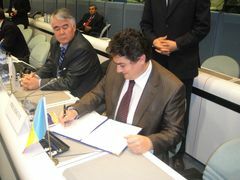 Under the chairmanship of the Republic of Moldova the activity on the development of the international transport corridor “Europe-the Caucasus-Asia” and further strengthening of transport infrastructure, contribution to the implementation of the Articles of the Basic Multilateral Agreement on International Transport for Development of the Europe-Caucasus-Asia corridor and concept of the reform of the PS IGC TRACECA. 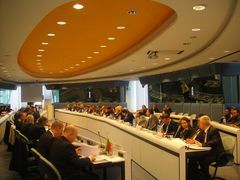 On the outcomes of the Eighth Annual meeting the IGC participants signed the Final Resolutions of the Eighth Annual Meeting (Conference) of the IGC TRACECA and adopted the Brussels Declaration. 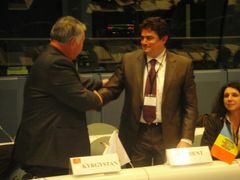 IGC expressed gratitude to the European Commission for the assistance in organizing the Conference and the hospitality received.